This tab specifies which set of optional CG modules (and which of a few base Lisp modules) are included in the standalone application that is generated from this project. At the left is an item-list that contains the names of all of the CG modules; these will all be selected initially in a new project. They can be individually turned on or off, but typically all you need to do is click the button to the right labeled Find Required CG Modules. This button will read the project's source code and determine which modules are used based on the home package of each exported CG symbol in the code. In order for Common Graphics modules to be found correctly, the latest version of all project files must be saved. When you use the Find Required CG Modules button, if there are any modified project files then you will first be prompted to save them. The procedure will not continue if you leave files unsaved. If all files have been saved, all project source code will be searched. Then all CG modules that are found to be used, plus all of the modules that those modules depend on, will automatically be selected in the list of CG modules, and all other modules will be deselected. The .lpr project definition file is saved automatically at the end of the procedure with its new list of required modules. If a project's source code modules load additional lisp files that are not themselves modules of the project, then the internally-loaded-files property may be used to cause the additional files to be searched. 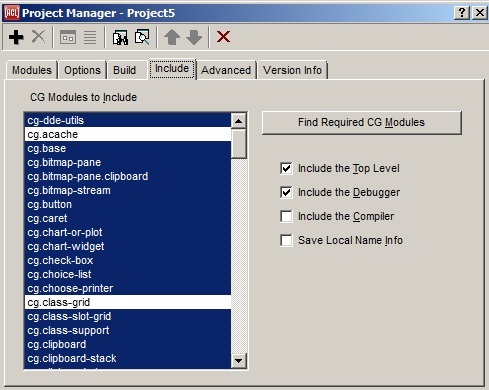 The Find Required CG Modules button calls the function find-required-modules, which can alternately be called directly to search a set of source code files other than those of the current project. In case it is not clear why some modules were required, a file called module-report.txt is written to the project's default directory, listing every symbol that was found for each module. But note that this file mentions only the modules that were explicitly used, and not the modules that were included because the explicitly-used modules required them. There may still be cases where a project needs a particular module even though it did not use any symbols that are specific to it. In these cases, the build will fail, and will probably mention a package that was not found. You can then explicitly select the module whose name is the same as the package name, and try the build again. Note that selecting a module in the list will automatically select any other modules on which that module is dependent. There also may be cases where the project manager believes that you may need a certain module that you do not actually use. You can try turning off this specific module, but "require" statements in other modules that you do need may load the module anyway. Include the Top-Level: if checked, the modules associated with the Lisp top level are loaded. Checking this is equivalent to specifying :include-tpl t to generate-application. Include the Debugger: if checked, the modules associated with the Lisp debugger are loaded. Checking this is equivalent to specifying :include-debugger t to generate-application. Include the Compiler: if checked, the modules associated with the Lisp compiler are loaded. Checking this is equivalent to specifying :include-compiler t to generate-application. You must have the proper Allegro CL license to include the compiler in an application (see runtime.htm). Save Local Name Info: if this option is not selected, then true is passed as the value of the discard-local-name-info keyword argument to generate-application. Otherwise nil is passed. See the general description of the Project Manager Dialog for details of the toolbar buttons.